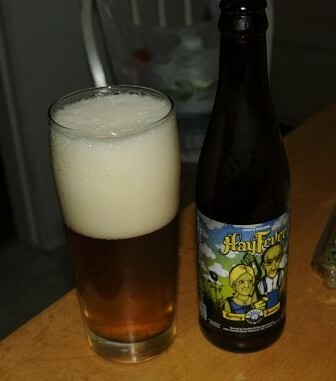 From Parallel 49 Brewing out of Vancouver comes their latest seasonal brew the “Hay Fever Spring Saison” availible in 6 packs. Hay Fever pours a straw yellow with a large off white head. The aroma is sweet and consists of wheat, pepper and yeast. The flavour consists of malts and wheat with yeasty and citrusy notes and a mild pepper flavour. This saison is one of the sweetest saisons I have had to date. This Saison may not blow you away but is a very good sessionable saison. I would say this is a good trait in any six-pack. The beer has an alcohol content of 6.5% and an IBU of 20. Parallel 49 has once again made a great beer that should be very enjoyable to a very large portion of the craft beer market in British Columbia. Good Job! Commercial Description: Till the earth, tip the bottle. With the new season comes a new saison – complex and fruity, with a semi-dri finish. This entry was posted in Saison and tagged bc, beer, canada, citrus, east vancouver, malt, malts, mild pepper, parallel 49, pepper, saison, saison ale, sessiionable, vancouver, wheat, yeast, yeasty. I need to get my hands on the Hay Fever. Looking forward to it! From what I understand it is still currently only sold at the brewery. It is either on route to stores on leaving soon.